18. Boxing a mark awarded for a scoring blow, knockdown, etc. The smallest unit in a composition, depending on the scale of the work; it may be composed of straight lines and arcs, forms (flowing and curvilinear), or a combination. a feature of an animal’s physical qualities used in evaluating an animal’s body conformation, breed traits, age, sexual development, health, productivity or performance, and breeding value. The points of an animal are considered collectively and in relation to one another. Different points are distinguished for different animal species and for the evaluation of different forms of productivity. A general evaluation is reached by adding up the points. 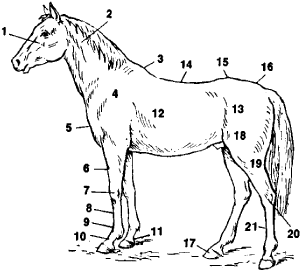 The principal points of a horse are shown in Figure 1.
a fundamental concept in geometry. In systematic expositions of geometry, the point is usually regarded as one of the primitive concepts. In modern mathematics the elements of various spaces are called points. In n-dimensional Euclidean space, for example, a point is an ordered set of n numbers. The points of different spaces may be of a very different nature. Points having special names are encountered in many areas of mathematics. In geometry, for example, the singular points of curves may be studied. Such points include cusps, isolated points, points of inflection, natural boundary points, nodes, points of osculation, and corner points. Mathematical analysis deals with such singular points as critical points of differential equations and singularities of analytic functions. In set theory, a number of points characterizing the properties of a given set have received special names—for example, limit points, density points, and boundary points. A tapering piece of land projecting into a body of water; it is generally less prominent than a cape. A printer's unit of measurement, equivalent to 0.013837 inch (approximately ¹⁄₇₂ inch) or ¹⁄₁₂ pica; six lines of 12-point type measure 1 inch. Also known as printer's point; typography point. A unit of mass, used in measuring precious stones, equal to 0.01 metric carat, or to 2 milligrams. An element in a topological space. One of the basic undefined elements of geometry possessing position but no nonzero dimension. In positional notation, the character or the location of an implied symbol that separates the integral part of a numerical expression from its fractional part; for example, it is called the binary point in binary notation and the decimal point in decimal notation. In marine operation, one thirty-second of a circle, or 11¼ degrees. 2. A mason’s tool; See wasting. 1. <unit, text> (Sometimes abbreviated "pt") The unit of length used in typography to specify text character height, rule width, and other small measurements. (1) To move the cursor (pointer) onto a line or image on screen by rolling a mouse across the desk or by pressing the Arrow keys. (2) In typography, a unit equal to 1/72nd of an inch. Points are used to measure the vertical height of a printed character. See typeface. Our meeting with Max Frankel was cordial and each of us made points that Frankel agreed were well taken. Who got the times to see the light? A lot of people have made points about the Springboks making a lot of changes in the second-half but they were out on their feet in the last quarter. Bass-baritone Jason Grant was a fine Angelotti, and the always-reliable Steven Cole made points as the tool of Scarpia.